Happy Monday, book lovers! 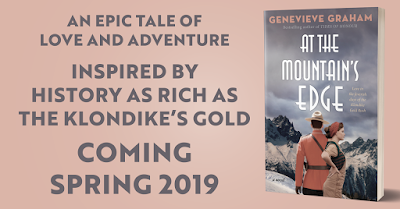 Today I'm excited to be part of the cover reveal for Genevieve Graham's upcoming Canadian historical romance At the Mountain's Edge. I love Genevieve's books, and I especially love that they shine a light on Canadian history. So, without further ado, check out the beautiful cover, followed by the synopsis and links to pre-order the book! From bestselling author Genevieve Graham comes a sweeping new historical novel of love, tragedy, and redemption set during the height of the Klondike Gold Rush. In 1897, the discovery of gold in the desolate reaches of the Yukon has the world abuzz with excitement, and thousands of prospectors swarm to the north seeking riches the likes of which have never been seen before. For Liza Peterson and her family, the gold rush is a chance for them to make a fortune by moving their general store business from Vancouver to Dawson City, the only established town in the Yukon. For Constable Ben Turner, a recent recruit of the North-West Mounted Police, upholding the law in a place overrun with guns, liquor, prostitutes, and thieves is an opportunity to escape a dark past and become the man of integrity he has always wanted to be. But the long, difficult journey over icy mountain passes and whitewater rapids is much more treacherous than Liza or Ben imagined, and neither is completely prepared for the forbidding north. As Liza’s family nears the mountain’s peak, a catastrophe strikes with fatal consequences, and not even the NWMP can help. Alone and desperate, Liza finally reaches Dawson City, only to find herself in a different kind of peril. Meanwhile, Ben, wracked with guilt over the accident on the trail, sees the chance to make things right. But just as love begins to grow, new dangers arise, threatening to separate the couple forever. 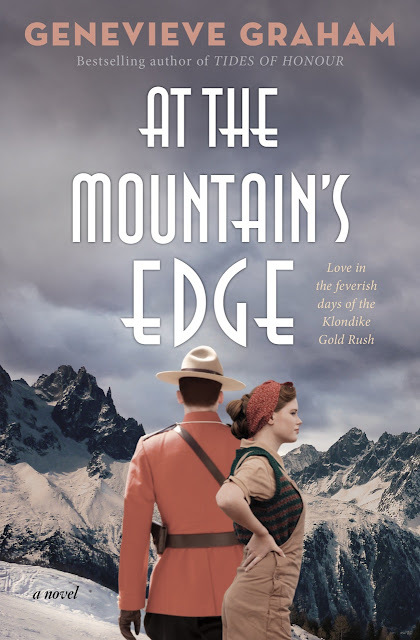 Inspired by history as rich as the Klondike’s gold, At the Mountain’s Edge is an epic tale of romance and adventure about two people who must let go of the past not only to be together, but also to survive. Pre-order At the Mountain's Edge now! Isn't it beautiful? The team at Simon & Schuster Canada always do such an incredible job with Genevieve's covers! This is officially the first 2019 release on my wishlist!